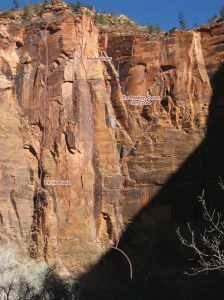 Brian’s latest challenging effort in Zion Canyon begins on the right-hand side of the Munge Tower. The Silverback then follows a Paul Turecki route called Soul Craft for one pitch before departing onto wild and cool new ground. Cracks of just about every range in size keep the climbing interesting up to the bitter end. The second to last pitch, dubbed the Silverback pitch, is sure to give folks a run for their money followed up with the crux of the route and final pitch. Brian freed every pitch on the route ground up in a day. Descent: rappel the route using 2 ropes. Which SuperTopo guidebooks include a topo for The Silverback?